Sleeve notes in English, German and Finnish. Anastasia Injushina is an imaginative, often compelling Mozartian. The variation sets that grew out of Mozart's own improvisations come off especially well, with Injushina relishing both their extrovert brilliance and their textural subtleties. The two sets of variations, in particular, are imaginatively handled, and played with admirable keyboard suppleness. 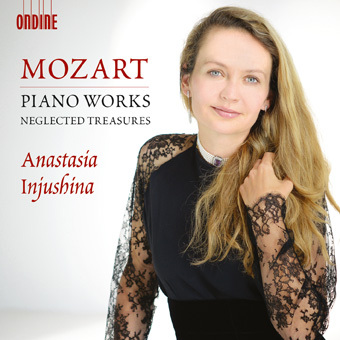 Second release on Ondine by the award-winning pianist Anastasia Injushina features some of the lesser-known aspects of Wolfgang Amadeus Mozart's (1756-1791) piano music. Injushina is particularly known for the poetry and sensitivity in her playing, which makes Mozart's music, among others, a perfect choice for repertoire for her. During the 1780s Mozart became deeply interested in Baroque music. In Vienna he took actively part in Sunday meetings arranged by van Swieten where the music of the old masters, such as Handel and Bach, were played. As a result the influence of Baroque music became visible in some of Mozart's works which are heard on this disc. The Suite in C was influenced by Handel's piano suites. Prelude and Fugue is a great example of Mozart's interest in the art of the Fugue and the music of Bach. The Sonata movement KV 312 and Andante in F major for Small Mechanical Organ are among Mozart's last completed pieces. Twelve Variations in C major on "Ah vous dirai-je, Maman" is a delightful piece based on the famous children's song Twinkle, twinkle, little star.